When we were visiting the gallery the other day, we learned they were offering a free weaving class hosted by Minnesota artist/instructor Becka Rahn. 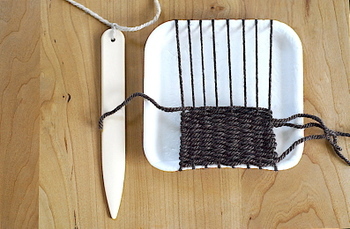 To my chagrin, I've never really been excited about weaving. I tend to pursue crafts that are not only creative and beautiful, but have a practical aspect as well. 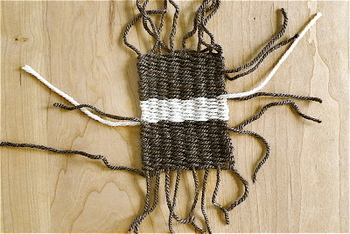 Weaving, to me, meant wall-hangings, and, well, I just don't need a wall-hanging. But, we've enjoyed getting out lately and this was a free class for the family, so I thought, what the heck, let's go ;) Well, we had so much fun and Becka showed us such an easy technique that I must say I'm now a convert. I still don't need a wall-hanging, but I've discovered there are many other practical uses for weaving, i.e. rugs, place mats, coasters, etc. I thought I'd share with you the technique we were taught. This is appropriate for any beginner (there was even a 3 1/2 year old at the class). 1. 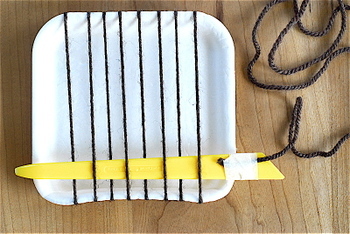 Tape one end of yarn to the backside of the tray at the bottom corner as shown. 2. 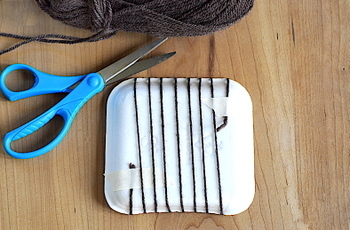 Wrap the yarn around the tray, back to front, until the whole tray is wrapped. 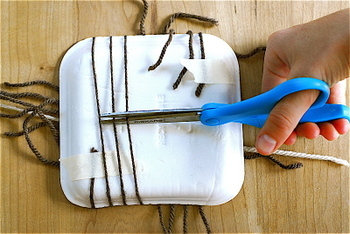 Try to make the wraps equally spaced apart and finish with an even number of wraps. In this photo, I've wrapped around 8 times. 3. 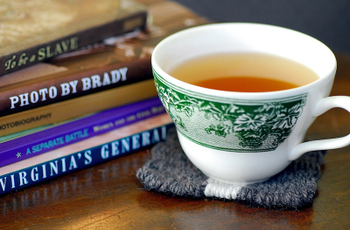 Turn the tray over to the front. The parallel lines you've just created is the warp. Now, cut some yarn about the length of your arm. You can use a new color or keep it the same. Tape one end of the yarn to your "shuttle". In the class, we used popsicle sticks, but at home I used one of our clay sculpting tools. 4. You're ready to start! Place the shuttle over or under (doesn't matter which) the first yarn and continue going over/under pulling the yarn through. Leave a nice sized tail. 5. If the shuttle finished by going over the last yarn, then go under the same yarn when you return and vice versa. 6. 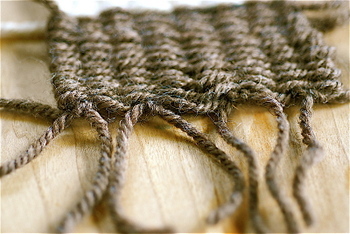 The yarn being woven through the warp is the weft. When you've used your length of yarn, cut, leave a tail, and tape on a new piece of yarn. Anytime you want to change colors, use the same technique. Again, if the shuttle finished by going over the last yarn, then start the new yarn by going under. If you finished under, then start by going over. 7. Here, I'm changing yarn colors. 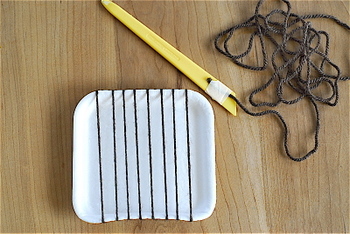 I'm using a bone tool as a shuttle and instead of taping the yarn, I'm just tying it through the hole. 8. I'm finished with the weaving part. 9. 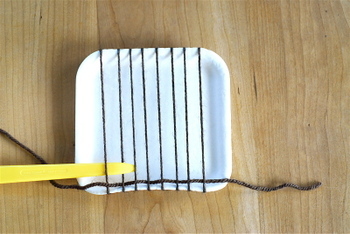 Turn the tray over and cut the thread through the center and un-tape the ends to release your weaving. 10. Now, you're ready to tie up all those loose ends! 11. 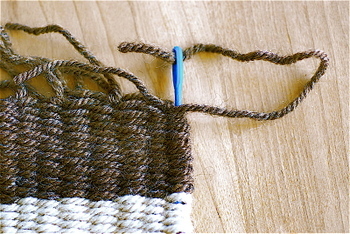 Knot off the warp ends (the ones on the top and bottom) by tying in pairs. 12. 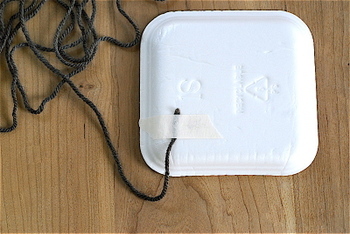 The knot-tails can then be threaded through the weaving using your plastic needle. Don't do this step if you want to leave the threads for fringe. 12. 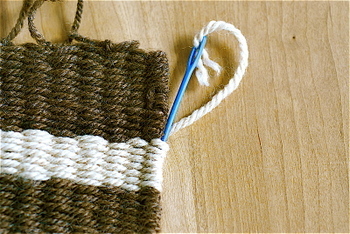 Next, thread your plastic needle with a tail from the side and thread it through the length of the weaving. Continue until all tails are nicely tucked in. Great idea for children...I'm from Chile, Southamerica and I really appreciate your wonderful tutorial! This is such a fun, simple, and creative idea. 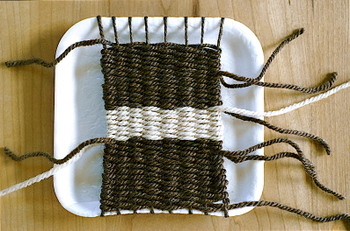 I was stuck for a gift idea for a friend, but I think I'll weave her some coasters! neato! i've weaved like that on a piece of cardboard, but never on Styrofoam. how clever! This is great, thank you for the great tutorial! I am soooo going to try this (been trying to limit my use of the word "so", but there it strikes again...I blame you for having such a wonderful demonstration)...thanks! Ooh! Great tutorial! Thank you! this is awesome and we are doing it soon! merci! 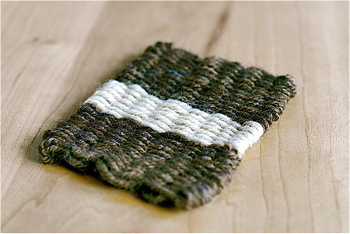 Hi, just happened upon your blog, Thanks for sharing this kid friendly weaving project with us. We will be trying it soon. Ooooo. This looks fun. Thanks for the great tutorial! Fun! We have been weaving too, but with yarn and it takes a long time...so the boys do bits at a time. I think that thicker yarn and smaller size might be good too! I had a kids weaving book that had lots of good ideas for making frames from cardboard or sticks. Cool stuff. That turned out nice! I love this! I'm saving it for when my daughter is a bit older. Great tutorial.